In 1764, a Yeshiva Jew named Mayer Amschel Rothschild waxed wealthy under the favor of his patron, William IX, Landgrave of Hesse-Cassel in Frankfort. William IX was a coin collector, and the pawnbroker Mayer Amschel supplied him with rare coins. An association developed which proved advantageous for monarch and subject alike. When the Landgrave rented the Hessian mercenaries to George III of England to fight against the American patriots of the Revolutionary War, Meyer Amschel handled the financial arrangements. 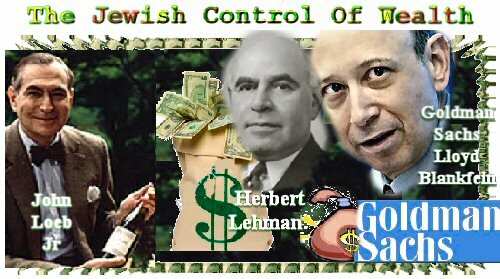 Thus the Jewish House of Rothschild began its first financial “war” venture. The Rothschild’s opportunity came with the Napoleonic wars. They financed England largely and made England pay generously for it. The Jewish Encyclopedia informs us that the Jewish House of Rothshild made a banker’s profit four times on the 80,000,000 pounds sterling of gold bought for use in Wellington’s victory: on the sale of gold to Wellington; on the sale of Wellington’s paper; on the repurchase of gold from Wellington; and on the sale to Portugal of the gold bought back from Wellington. The end of the Napoleonic wars found the Jewish House of Rothschild entrenched to exploit their opportunities. For example: Austria-Hungary after the war in attempting to put her finances in order, retire her paper money, and reduce the public loan, required ready money. Her share of the French indemnity was payable over a series of years. For generous discount the Rothschilds advanced the indemnities. The Rothschilds, though Jews in a Gentile Christian society, demanded as their reward, titles of nobility. THIS UNSEEN POWER has indeed subjected America to its occult Jewish control. Perhaps the best proof of the constant expansion of Jewish financial power in America is furnished by the activities of the great Jewish banking houses and investment companies. Year by year, Goldman, Sachs and Co., Kuhn, Loeb and Co., Lazard Freres, Lehman Brothers and others, are pushing their financial control deeper and deeper into the American economy. It should be noted that though these banking houses have non-Jewish partners, they nonetheless remain firmly in Jewish hands. By the 1970’s, other Jewish partners of Goldman, Sachs were on the Board of Directors of such companies as: Continental Can; McKesson and Robbins; Champion Papers; United Biscuit; B.F. Goodrich; Pillsbury; and Sperry-Hutchinson. Partners of the Jewish banking house of Kuhn, Loeb are directors of: Westinghouse; Sears Industries; U.S. Rubber; Getty Oil; and Kennecott Copper, to name a few. Lehman Brother partners are directors of: Pan American Airlines; 20th Century Fox; Cheesebrough Pond’s; Bristol-Meyers; RCA; and Caterpillar Tractor, again to name only a few. JEWS CONTROL OUR LIVES and the “Anti-Semitism” of our day has as its watchword, Fagan is alive and well on planet earth. Politicians and Universities with their large Jewish endowments, who like the European powers of the 19th Century, are fawning in abject subservience to the Jewish financial moguls. The removal of all things Jewish from rational discussion relegates unfriendly opinions of Jews in the hushed subconscious of millions upon millions of Americans. Instead of submitting a critique of the Jews to the free play of ideas, the Jews and their liberal supporters have managed to organize an inquisition in which all writing and thoughts critical of Jewry are treated as a threat to the moral order of mankind. BUT THE MORAL ORDER of mankind has been subverted and overturned by the Jewish control of wealth. The Jews get what they want, whether or not it serves the interest of morality, because of the root of all their evil, that is, their money. But the sudden release of resentment pent up in millions upon millions of Americans, could very well erupt into an explosive backlash against the Jews with their control of our lives. THE ONLY ANSWER in preventing such an eruption, is for America to become a Christian nation once again and put the Jews in the rank of the “infidel.” This will be the beginning of severing their the Jews’ control of our lives. Let the Jews be told that their ancestors committed Deicide in crucifying the Lord of Glory, Jesus Christ. And let the Jews be told, (if we set the example), that they need to repent, and become good Christian citizens of the host nation in which they reside. Nothing is unstoppable if the entire nation would wake up to reality. I am realy glad to find this site which is talking about the real issue. you all have been too long duped by the scheming parasites..
poor Westerns, proxy for jews. Hurray, hurray … some of us are finally getting to the ‘real’ truth. The world IS controlled by a few hundred, maybe a thousand or so, ultra rich, ultra secretive families. For all who still wonder why and for those that can’t seem to understand what’s going on in the world. For all those still divided by petty differences. For all those that still have a partisan mindset. In other words; us vs. them and Dems vs. Repubs. Let me present the ultimate evidence of world wide manipulation and control. Written over 150 years ago, by the evil doers, for the evil doers, this document has been denied by them as bigotry. But after you read it and see that all the plans and proficies have come to fruition there can be no denying the truth. They never denied the existance of this document, only to say it is racist and bigoted. They never deny the contents thereof. For over 100 years it has been hidden and censored. I am not a Christian. I am a Muslim. We the Muslims and Christians face a common enemy in fighting the Jews. We need to be more organised like them and start working together. We can’t surrender all our wealth for them to exploit. Many of the more intelligent sheep are slowly realizing that the UN and IMF are establishing a ‘One World Currency’ in the form of the SDR. This is good, no? Honestly, if GOD spares the United States, wouldn’t he have to apologize to Sodom and Gomorrah? We must rise against the Zionist Self-Chosen, racist, pseudo-Jew Khazar Capitalist and Communist comrade commissars who, as usurious parasites have bought, cowed, and fostered the anti-christ priests who occupy the churches and just preach the Jews’ aggrandizement of themselves, and their committed holocaustic slaughters of enemies as a warning that we must “love your enemies” and “turn the other cheek” etc, — meaning to our leechers. These anti-christ priests keep us a flock of driven, penned-in sheep, always bleating “forgive the leechers” for keeping us bled until dead as their max profitable, cheapest work and war fodder, bowed slaves butchering each other, e.g. in Iraq, Afghanistan, etc, for Zionism’s expansion and consolidation in our once countries that are made colonies in Zion’s global imperium of usury. If we don’t rise, then we will continue to exist and die as our leechers’ slaves unless we preach and do as Jesus who gladly and bravely sacrificed His life for primarily preaching His revolutionary anti-Judaic Christian faith. Christianity is the foundation of democracy, and we must ruthlessly driving the parasites out of the temple, saying God is not shyster’s robbed money and we are all God’s children. Plus anyone who abuses a child should have a millstone put around their neck and dumped into the sea as a part of the fight against Judaism’s enshrinement of usury and their self-ordained ‘god-chosen’ racism. MANY Orthodox Jews in America, Europe, & elsewhere come from families who were robbed OVER and OVER again throughout many centuries — and they keep rebuilding and getting wealthy again and again because they follow God’s Commandments better than a lot of us CHRISTIANS. Just because first century Jewish authorities had totally corrupted the Truth found in the writings of Moses and the Prophets, does not mean that subsequent generations (not to mention thousands from the first century, like the Apostle Paul) have not turned away from the folly of “works of the law” mentality that Jewish leaders periodically find so seductive. There are MANY Jews who are BLESSED by God because they KNOW HIM as their SAVIOR. (Is. 43:3) They even BELIEVE in Jesus Christ without recognizing Him! His NAME is “Yeshua haMaschiach” — meaning “Salvation (of) the Anointed One of God”. Please don’t count the Jews out. RATHER, we need to be walking in righteousness and bringing forth the Living Water of Jesus from our lives so as to make the Jews JEALOUS of the LOVE that THEIR GOD has for US! Just because a handful of very wealthy Jews own the banks, don’t miss the growing number of righteous Jews who are waking up across the earth, yes - and even recognizing from their own Scriptures that we Christians were spoken of time and time again in relation to THEM in the days preceding the coming of Messiah! THEY WILL AWAKEN if we will give them TIME. If I understand the Prophets correctly, the Globalist elites including those very wealthy Jews you have mentioned, are actually GIVEN AUTHORITY BY GOD (that is — the AntiChrist and his companions) for a PURPOSE — just like Pharaoh of old. We don’t have to COOPERATE fully, but we only have so much means to resist them and the reason can’t STOP them is because they have a PURPOSE. But these certainly do NOT represent the majority of Jews today — and certainly of Torah-studying, Orthodox Jews; any more than Hitler represented the Christians of his day, even though he cited Protestant Church teachings in some of his speeches. Lemuel, I totally agree with you and I am a Christian. I love Israel and the Jewish people. I am disagreeing with you though, when you say it is only a handful of Jews that control the wealth. I have been doing a lot of research in a lot of different sources, and I have come to the conclusion that a great number of “crossover” Jews are to be included in this group. Take a look at Bloomberg, mayor of NYC that recently banned Christian churches from assembling in public schools. Furthermore, hauled 7 Christian pastors to jail for demonstration against this city ordinance! Bloomberg certainly is a Jew and wealthy and corrupt at that. How about George Soros, that has sworn to destroy our country as we know it? How about Mayer Rothschild’s family that have so manny underhanded connections to this country’s banking system like J.P.Morgan and Co., Rockefeller etc. There is not enough space on 10 of these web pages to list them all. I agree with you, the Jewish people is chosen by God as His people, but there will only be a remnant of them left (144000) at the end. Don’t tell me you don’t know of the remnant, He refers to them again and again. I love the Israel and the Jewish people, because He tells me to and I do from my heart. I would go and help them fight for their country if that was practical for me. Whatever happened to the 2.3 trillion dollars that the Pentagon lost? It was announced it was lost one day before 9/11. @ shamim The Ron Paul movement has started. The average American is still being duped by the msmedia. The younger generation is not getting news from the TV. They are getting it from the Internet. Average Americans are continuously being bombarded with Muslim terror plots. Also most Christians I know think the Jews are the chosen people because they think it is in the Bible. I can’t speak for Orthodox Christians, but the Christians I know don’t focus on Jesus being killed by Jews. Instead they see it as Jesus died for our sins. The price for our sins was death but he died for us. It is almost taboo to talk about “Jews.” But it is very much accepted to expose criminal schemes. This is where Ron Paul comes in. TV is the brain washer. The Internet is the ultimate venue for freedom of speech. The truth comes out on the Internet. The Ron Paul supporters are not necessarily pro-Muslim or anti-Jewish, But they are aware of the Federal Reserve and the Forming of the Police State. Ron Paul supporters are young and will greatly influence the Republican Party in the Future. The criminals do not want to be exposed. This is their Greatest Weakness. Humanity is the answer, not another religious crusade. The more we kill and divide ourselves with religion, the more the Jew laughs. Now as Britain and America have been slaughtered by huge bank bail outs, illegal costly wars, which were only to make us more enemies and mass migration in to our nations. We are starting to think, ‘how did this happen?’ Do not worry, we will not think for long, our biased dreadful news channels will have us blaming something else for the Western world failing apart. Single mothers, Muslims or drug users will get the blame in the Zionist news rags and news channels, when anybody with a brain can see it was a criminal conspiracy by Zionist banksters to take every spare penny we had and make us so many enemies the world over. We will be to busy suffering and fighting we will not see the creators of this. We are told daily to hate Muslims, we bomb them, then they are allowed in to our countries to stay. There is the final nail in our coffin, the civil wars which will happen throughout Europe when we realise we have been duped by this PC because we were all told it was racist to question how many of these people we let in. Remember, these people (Muslims) have good reason to hate us since we have been invading and cluster bombing them. Now that they are getting the numbers in britain and all over Europe, they will want revenge. Atheists, Christians and Muslims should all realise we are being used against each other, but we never will. Too many morons watching television and letting the TV do their thinking for them. PC was always a lie. The White European nations grew great without mass migration in to our lands. Now we have been swamped in large areas with people who hate us. It does not look good, in fact it’s bleak.